“These are graduates that we expect to be leading, indeed likely transforming, healthcare and research." MDHS Dean Shitij Kapur announces the Faculty's top-performing students in 2017 at the Dean's Honours Celebration. 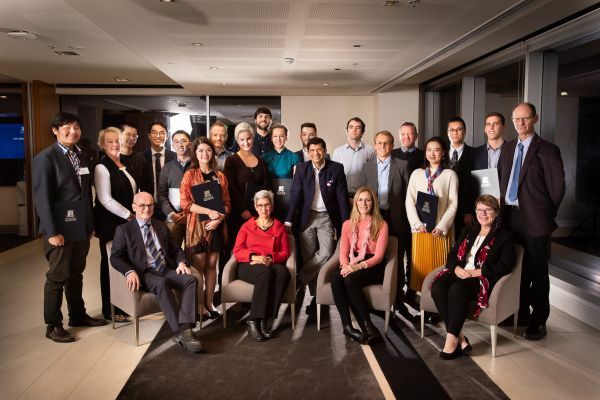 Recipients of the 2018 Dean's Honours. (Image: Casamento Photography). A founder of a real-estate start-up, a researcher of parasitic worms, and a drummer-turned-mental health advocate, have all been recognised in a celebration of some of the top students to have graduated from the Faculty of Medicine, Dentistry and Health Sciences in 2017. Now in its second year, the Dean’s Honours Celebration recognises recent graduates who have achieved the highest academic results in several of the Faculty’s flagship courses. As noted by the Dean, Professor Shitij Kapur, the awardees have in common a commitment to deeply engaged, active and self-directed learning. “Not surprisingly, their achievements extend well beyond the classroom,” he said. “Perhaps most importantly, these graduates have pursued their studies with the capabilities and values that we as a Faculty see as so important: collaboration and teamwork, compassion, respect, integrity and accountability. Doctor of Medicine Callum Umstad has won most of Melbourne Medical School’s prizes, for his achievements in Rheumatology to Ophthalmology to Surgery as well has having won the RMH Clinical School Long Case Prize, awarded to a second-year student who demonstrates outstanding ability to effectively communicate and interact with real patients while developing the aptitude of clinical reasoning. Many medical students find their first ward rounds confronting. Doctor of Medicine Jeremy Clark impressed his professors with his ability to rapidly establish respectful, thoughtful relationships with patients. His clinical coach and ethics tutor, Professor Michael Pain, admired his inquiring and critical eye, saying Jeremy “frequently challenged me over clinical findings and we often disagreed on some ethical issues.” He also highlighted Jeremy’s appreciation of the “bigger picture” and his interest in medical history. Daniel (Dong-Kyoon) Ko entered the Doctor of Medicine program in 2013. He was previously awarded the RM Biggins Prize in Clinical Medicine, which is awarded to final year students demonstrating both academic distinction and the qualities of a future conscientious, generous physician. A talented drummer, Master of Psychology (Clinical Psychology) student Mirra Seigerman has taught music in schools. His interest in clinical psychology has gone beyond individual client work to include involvement in advocacy campaigns for mental health with leaders in the field, such as Professor Pat McGorry. Laura Xin Meng Shan displayed intelligence, inquisitiveness, and strong critical thinking throughout her Graduate Diploma studies. She received a prize for best oral presentation in the capstone subject, and kept all her lecturers on their toes with her sometimes tricky, but always insightful and constructive questions. Master of Psychology (Clinical Neuropsychology) James McDonald left an extremely promising career as a neuroscience researcher – which included a postdoctoral fellowship at the Max Planck Institute for Biological Cybernetics – to enter clinical studies out of desire to “change things for the better”. Scott’s outstanding academic successes point to the opening of rich opportunities to realise his goals. Doctor of Dental Surgery Kevin Lee displayed persistence and focus throughout the past four years which saw him achieve leading academic performance in the course. Kevin was particularly adept at extending himself in his clinical component of the Doctor of Dental Surgery. Bachelor of Oral Health graduate Rubab Batool was an exceptional academic achiever and a deeply engaged student, having contributed to the hosting international visitors and assuming representative roles in her cohort. Rubab undertook a final-year project comparing the oral health of adults in Australia and Sweden, culminating in an exchange to ARHUS University in Denmark. While completing the Master of Public Health, You (Eunice) Wu was Treasurer of the Master of Public Health Student Association and worked as a Research Assistant for the Health Economics Unit in the Centre of Health Policy. In her final year, she completed a large project at Price Waterhouse Coopers; contributing to a report which provided system–wide recommendations in order to improve outcomes in musculoskeletal health in Australia. Within her first six weeks in the program, Master of Nursing Science Courtney Kubitschek collaborated with her peers to develop an electronic health promotion resource to discourage drink driving, with the slogan, “Coffee plus alcohol - It still equals drunk”. Courtney’s passion for using evidence to change community behaviour will make her a formidable force in the profession. Previously, Courtney was the founder of a real-estate startup. Master of Speech Pathology Matthew Fong has performed at a consistently exceptional level across his course work, clinical work and independent research. He has received three awards in recognition of his academic excellence, particularly in adult speech and language disorders. Hannah Price, Master of Clinical Audiology, commuted weekly from Mildura to Melbourne to attend class. She always intended to bring back her expertise to service her community, and has undertaken her first graduate audiology position in Mildura. As well as being Dux of his class, Doctor of Physiotherapy Campbell Flack convened a two-day DPT Student Conference in his final year, a mighty logistical undertaking on the theme of Achieving Innovation and Change in Health. Master of Social Work Allison Browning is a gifted student with intelligence, warmth and high-level interpersonal skills . Her teachers expect her to make a significant contribution to the profession. Doctor of Optometry Alex Kaye has returned from an overseas capstone experience on South Africa’s Phelophepa Health Train – a mobile health service travelling to impoverished rural areas. He has a strong desire to contribute to the “bigger picture” in optometry and public health. Richard Yan, who started at the University as a Chancellor’s Scholar and is now in his first year of Medicine, is a previous recipient of the TF Ryan Prize for Anatomy, and the Ian Holmes Medal for Virology. In 2017, Richard was Treasurer of the Biomedicine Students Society, which raised $20,000 for Muscular Dystrophy Research. Demonstrating the breadth encouraged by the Melbourne Model, Crystal Li has completed electives in sports coaching, Music Psychology and Criminology while also going on to achieving outstanding academic results in the Master of Biomedical Science..
All the very best to all Dean’s Honours recipients.